Conspiracy is drawing near, and while the limited player in me is all too excited to take a seat at the draft table, the Commander player in me is simply overjoyed. I always love it when Wizards of the Coast makes it blatantly obvious that they kept the Commander format in mind when designing a set. 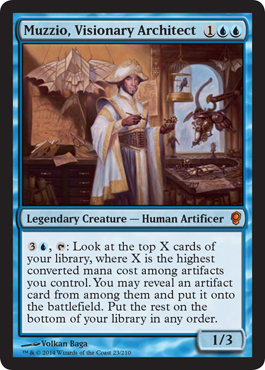 While the ideas behind the cards keep in line with the individual sets themselves, its always nice to see that Commander flavor in a supplementary product, ever evolving and adding to the plate we Commander players have set in front of us. After having built over fifty different Commander decks, my palate has become rather picky and craves new flavors. 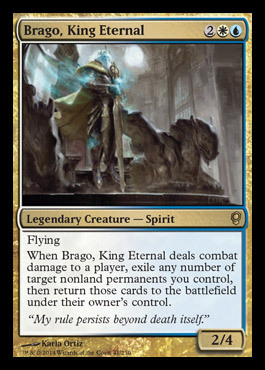 We all knew after the spoiling of Brago, King Eternal that the set would include, at the very least, five different Legendary Creatures, and the first three of the five were all that we could have imagined. I wanted to know what the man clad in white, and that…”creature” on the far left of the artwork would do, but there was nothing that could prepare me for what came next. These two surprised me. I had honestly expected, from the look of his attire, that Muzzio would be white, despite two of the other Legendary Creatures already containing the color, and while Muzzio’s mono-blueness was undoubtedly shocking in my opinion, Grenzo took the cake. The uniqueness I was seeking in the other Legendary Creatures was found. Neither of these creatures is necessarily broken, at least that’s how I see it. As a matter of fact, Muzzio is slightly disappointing. A four mana, activated dig ability that has a high likelihood of failing depending on your board state seems bad. I can see him being a solid replacement for Arcum Dagsson in groups where the little artificer is thoroughly hated, but overall, he’s a noticeable downgrade. And though Muzzio is somewhat terrible in comparison, you have to take into consideration that he’s being compared to a card that is essentially Tinker on a stick, and Tinker is banned in well…everything it can be banned in, except for Vintage, where it’s still RESTRICTED. So Muzzio had a pretty high bar to reach from the get go, so I’ll cut the guy some slack. If you can manage to get something along the lines of a Blightsteel Colossus on the field, Muzzio’s ability will be able to hit anything in your deck, unless you’re that one person actually playing Draco in a mono-blue deck, in which case I applaud you. But lets be honest, if you have a Blightsteel Colossus on the field, the likelihood that you really need anything else is pretty low. So the ability to essentially “Cascade” into other artifacts such as Mycosynth Lattice or Darksteel Forge is a solid little ability, but I feel it would be better received if it wasn’t put in the same room as Dagsson and Memnarch. Will Muzzio experience the comfort of the Command Zone? More often than not, no. Will he see play? Probably. In Arcum Dagsson and Memnarch lists. 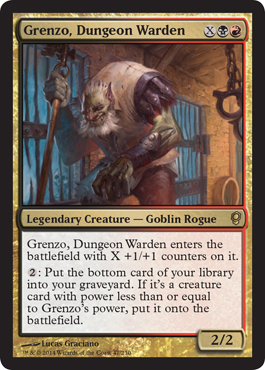 And then there’s Grenzo, Dungeon Warden. This guy is as unique as they’re going to get. 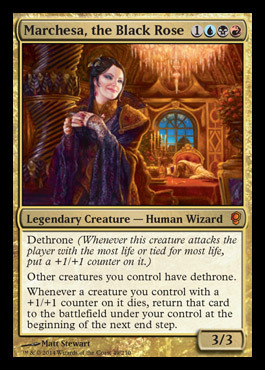 Marchesa and Selvala may include new mechanics, but Grenzo is stepping into territory that no other Commander has tread before. Bottom of Library abilities are not often seen in Magic. Sure there are abilities that place things on the bottom of your library, but there aren’t many that take cards FROM the bottom of your library. When I first saw his ability, I misread it. I thought he put things from your graveyard TO the bottom of your library unless the creature’s power was less than his own, and while this ability would still be unique in it’s own right, it would be slightly more powerful, almost too much so. However, after rereading, I realized that that wasn’t what he did at all. Utilizing the ability to place things on the bottom of your library is key to playing Grenzo, however, this is not necessarily the easiest thing to do. Red and Black have a distinct lack of scrying abilities, however, they are not without their tools. The card I’ve seen talked about most with Grenzo is Reito Lantern, and while yes, this is a sweet interaction, it is neither the best nor the only card we should be considering for our Grenzo decks. One of the cards I distinctly remember playing in my red decks that was simply a fun little interaction was Kaboom! I played it initially just because I liked the name of the card and the fact that it could hit any number of my opponents. The potential of this card was pretty great, as I played it in a Red/Green ramp build full of big creatures and spells, and more often than not, I ended up dealing six damage or more to each of my opponents whenever I played it. But now, with Grenzo in play, this is a solid way to not only damage opponents, but also to capitalize on Grenzo’s effect. In the late game, with Grenzo sitting at say eight power, playing Kaboom! and revealing something along the lines of Rune-Scarred Demon, Sheoldred, Whispering One, or Sepulchral Primordial is a solid way to make your opponents groan in disdain. Considering, in this situation, that Grenzo is a 6/6, we assume that we have at least eight mana available. Playing Kaboom! to deal seven damage to an opponent and placing either of the creatures mentioned previously on the bottom of our library to recur with Grenzo is insane. Dealing seven damage to each opponent and getting a 12/12 flier for seven mana seems like a good deal to me. I’m looking at you Furyborn Hellkite. Mindmoil is quite possibly one of the single most underrated red cards I’ve ever seen. Most players I know look at the card and see shipping cards every time you cast a spell as somewhat of a drawback. However, with Grenzo, this simply allows you to play a low cost spell in order to lower the cost of your creatures. Casting a Sol Ring to ship a Grave Titan to the bottom of your library and put it into play for technically one mana is just crazy. And in the late game, this card works as a chain, allowing you to repeat this interaction more than once a turn, capitalizing on smaller spells to cheat larger creatures into play. The distinct lack of scrying done in Black and Red is a problem for Grenzo. He wants to be able to choose whether to keep something on top or ship it to the bottom. Cards like Fated Conflagration and Fated Retribution, are fun and may just find their way into my list, but we still want a more consistent source of scrying, and Crystal Ball gives us just that. Instant speed deck and draw manipulation fits perfectly into Grenzo’s toolbox, and I can’t see a Grenzo deck functioning perfectly without this little artifact. I, personally, can’t wait to play this card, scry something like a Kokusho, the Evening Star and Defiler of Souls to the bottom and play them both for a total of 4 mana. Overall, Conspiracy has not been disappointing for the Commander format. 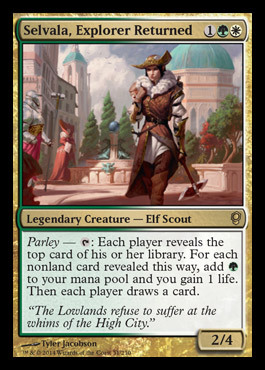 Whether you’re flickering permanents with Brago, King Eternal, recurring with Grenzo or Marchesa, cascading through artifacts with Muzzio, or just giving everybody a great big hug with Selvala, Conspiracy should be a blast to Command. As always, thank you for reading. Feel free to leave comments, questions, ideas, and feedback in the comment section below, and keep watching for more Commander tips and tricks in the days to come.